No-Drip Liquid Nasal Spray helps knock out nasal congestion and sinus pressure. Contains soothing aloe vera. Provides fast relief and lasts up to 12 hours. Contains (2) bottles of 0.5oz Zicam Extreme Congestion Relief Nasal Spray. 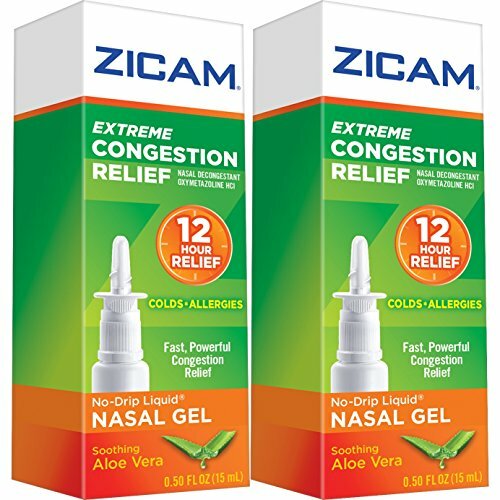 Zicam's Extreme Congestion Relief Nasal Gel is a fast-working nasal spray that provides relief from severe nasal congestion & sinus pressure due to the symptoms of colds/allergies. Zicam Extreme Congestion Relief is the maximum strength nasal congestion relief nasal spray providing quick relief from congestion. It also contains Aloe Vera to soothe chapped, sore, dry, or chafing nostrils. With Zicam Extreme Congestion Relief Nasal Spray, you get long lasting relief from nasal congestion (up to 12 hours!) in a non-drowsy formula, so you're free to continue your day without sniffles, sneezing, congestion, sinus pressure, and stuffiness. Zicam Extreme Congestion Relief's no drip liquid nasal gel is designed not to drip down your throat. It stays where you need it and works to clear symptoms of nasal congestion such as dryness, soreness, stuffy nose, sniffling, sneezing and sinus pressure.